A main goal of Formal Concept Analysis from its very beginning has been the support of rational communication. The source of this goal lies in the understanding of mathematics as a science which should encompass both its philosophical basis and its social consequences. This can be achieved by a process named ‘restructuring’. This approach shall be extended to logic, which is based on the doctrines of concepts, judgments, and conclusions. The program of restructuring logic is named Contextual Logic (CL). 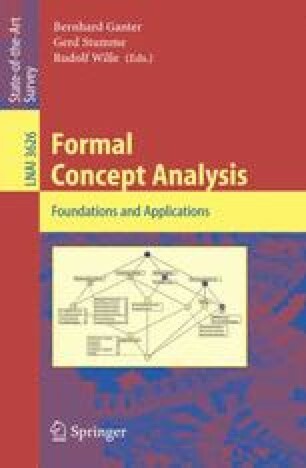 A main idea of CL is to combine Formal Concept Analysis and Concept Graphs (which are mathematical structures derived from conceptual graphs). Concept graphs mathematize judgments which combine concepts, and conclusions can be drawn by inferring concept graphs from others. So we see that concept graphs can be understood as a crucial part of the mathematical implementation of CL, based on Formal Concept Analysis as the mathematization of the doctrine of concepts.